View of the main (and only ) street as we left Hornillios. Look at the old floor joists extending out to hold the next floor – hundreds of yeas old. The white truck: kind of neat: that’s the bread truck. There is no bakery in town so the bread delivery man drives every block, sounding his horn and all those who want fresh bread can come out to buy it. And then visit with their neighbours! The difference irrigation can make! 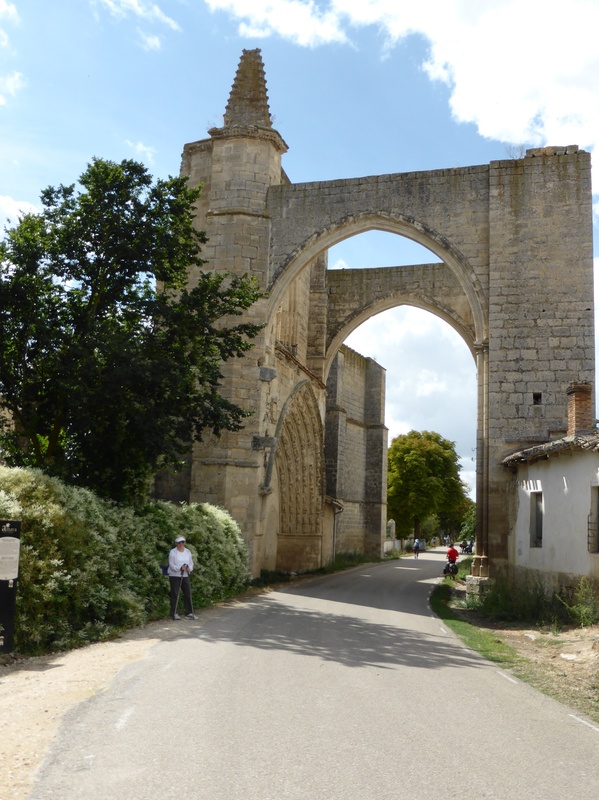 Arch for the monastery of San Antoine built in 14th century. Specialized in treatment of ilness known as “Saint Anthony’s fire” – caused by sensation of internal burning of it’s victims. Cause was a fungus in the rye bread commonly eaten in other parts of Europe but not Spain – therefore pilgrims found themselves miraculously cured on their way to Santiago. Little town of Hornillos – such a beautiful and peaceful place. 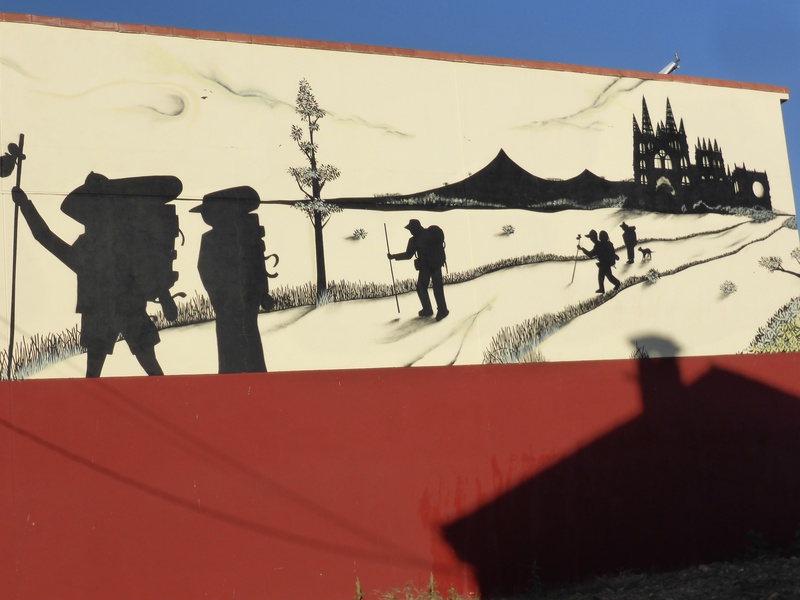 Has a definite future – town businesses understand the real value of the Camino pilgrims – have built an economy around the Camino – one of the few that has really grasped the economic significance of the hundreds who walk through each day. Energy from wind is really important in Spain. “Red Eléctrica de España (REE) released a preliminary report on the country’s power system ( 2014), revealing that for “the first time ever, [wind power] contributed most to the annual electricity demand coverage”. 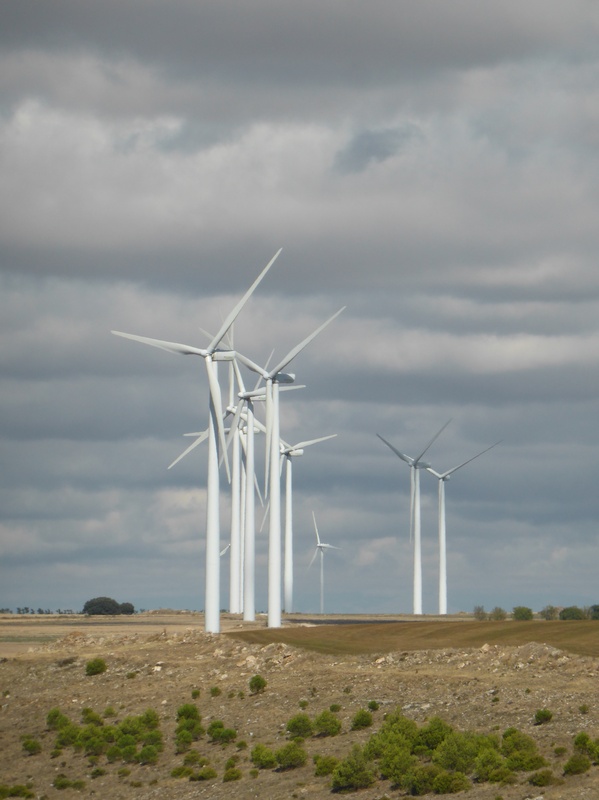 According to the figures, wind turbines met 21.1% of electricity demand on the Spanish peninsular, narrowly beating the region’s fleet of nuclear reactors, which provided 21% of power. Walked through miles of the Mesata area today. Much like foothills of southern Alberta except no farm houses. We assume that this land never has been owned by the small farmer, that is not the way European history worked. Peasants simply worked the land for the land owner – the state or church. Fundamental difference between population distribution in Europe and the new world. Here rural population is centred in small villages as it always has. Problem now is that these small villages are dying as the population turns to the larger centres in search of work. Note: There are many things shared with fellow pilgrims and as always as word is passed along rumours abound. It turns out the fellow that runs Sol de Sol in Hornillos is the brother of the young woman who married Martin Sheen’ s grandson. However, they did not meet when “The Way” was bring filmed but rather the movie was made because Martin Sheen is a devout Catholic of Spanish origin. It rained all night but we slept through it:-) As the forecast was for thunderstorms we did not dawdle over breakfast as we usually do. The trail was an assortment of paved highway, muddy dirt roads and rocky goat trails but all in all the walk was not difficult. We stopped for cafe con leche half way at a Hontanas, a pretty village. It is interesting to see the restoration going on here. The old stone buildings are gutted but the facades are reinforced. These are being converted to albergues and casa rural accommodation for pilgrims. At peak walking times pilgrims cannot always find a place to sleep. Also, along the Camino many of the churches and monasteries are being restored. 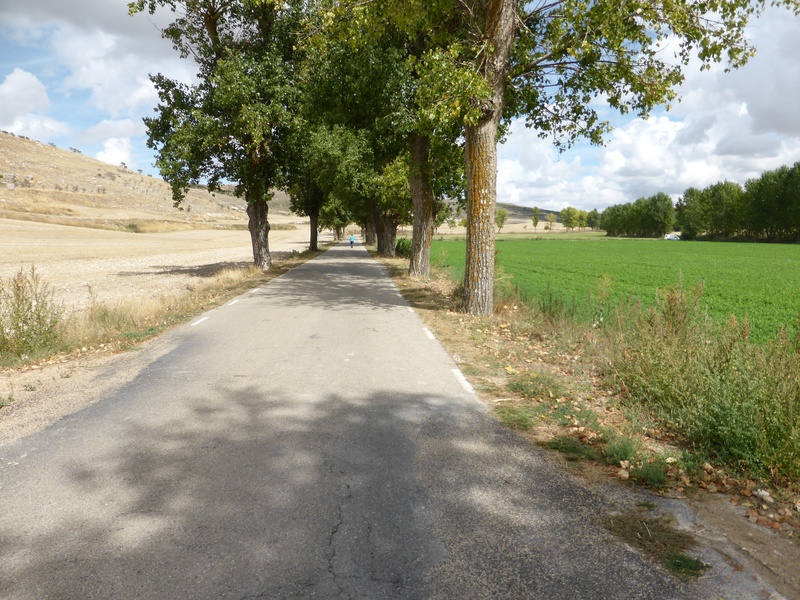 Purists believe this will ruin the Camino….Seeing people setting out before dawn to be sure of a place to sleep makes us grateful we have reservations. 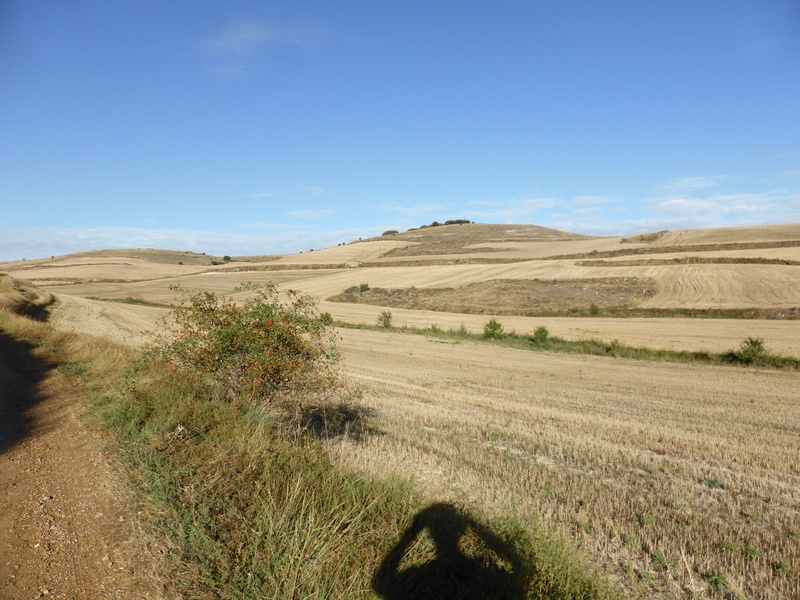 Despite the guide book warnings we found the Meseta to have a beauty of its own. Perhaps, being from North America, we are more used to vastness. In this area it is hilly with agricultural fields bring carved out of the steep hillsides. It is quite remarkable. There are also terraced areas of reforestation with pine trees. The soil looks so terrible–chalky and rock-filled but grains, sunflowers and alfalfa manage to thrive in it. Dotting the landscape are castles, towers, monasteries, and arches built many hundreds of years ago. We are truly walking through history. It gives us a sense of belonging and is also, somewhat humbling. We have a nice balcony off our room tonight with a panoramic view of the hills. 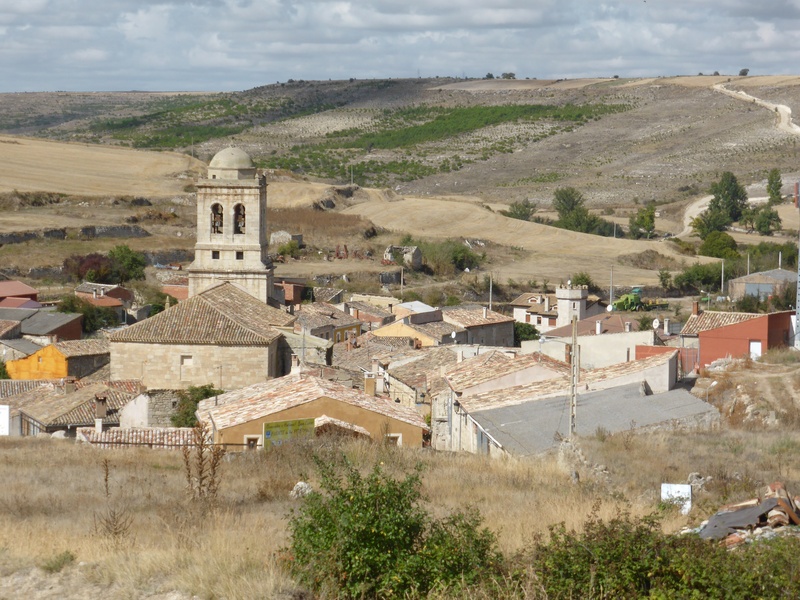 Tomorrow we have a rest day in Castrojeriz and we are looking forward to exploring. Almost there! Happy day of rest as you anticipate the final day of walking. 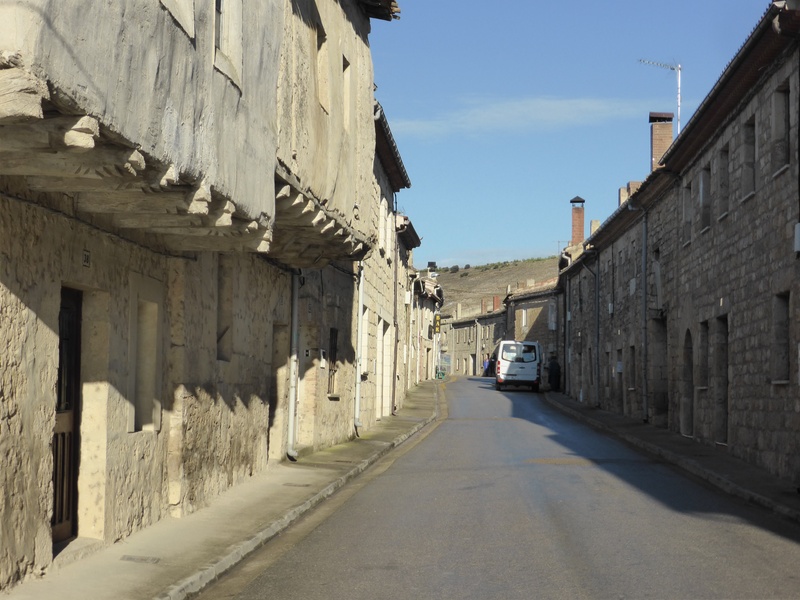 The photos of the meseta are lovely. I’m off to ‘visit’ Castrojeriz to see what you’ll be enjoying. Love to you from Gabriola. Linda spent the morning reading your complete journal; just loved it.